An appreciation dinner to honor the new owners of Sam Kane Beef Processors out of Corpus Christi, Texas was hosted by Graham Land and Cattle Company on June 19, 2013 in Gonzales, Texas. The dinner was attended by Beefmaster Breeders United (BBU) Executive Vice President Dr. Tommy Perkins and BBU Communications Coordinator Jeralyn Stephens. Several prestigious cattle industry professionals joined the BBU staff in honoring the new owners and the future of the South Texas cattle industry and beyond. BBU Executive Vice President Dr. Tommy Perkins and Ernie Gill of Prime Cuts radio visits with Dr. Charlie Graham. Among the attendees were Texas Commissioner of Agriculture Todd Staples, Texas Land Commissioner Jerry Patterson and the Houston Livestock Show and Rodeo Chairman of the Board R.H. “Steve” Stevens. While representing the Beefmaster breed the BBU staff visited with several other attendees that ranged from radio hosts to pharmaceutical representatives and college professors to cattle breeders prior to the dinner presentation. The evening was of course catered with an outstanding steak dinner and the presentation was emceed by the owner of Graham Land and Cattle Company, Dr. Charlie Graham. The presentation started with Mr. Staples addressing the crowd and assuring them that despite the low cattle numbers throughout the state of Texas he has confidence that the new leadership at Sam Kane Beef Processors will provide excellent guidance and service to cattle feeders, as it always has. Mr. Patterson also addressed the crowd with great confidence in the new owners and investors. Patterson and the owner of Capital Land and Cattle Jim Schwertner both expressed that the beef industry needs to fight government over-regulation and the crowd was encouraged to contact their representatives to combat the issues plaguing the cattle industry on Capitol Hill. 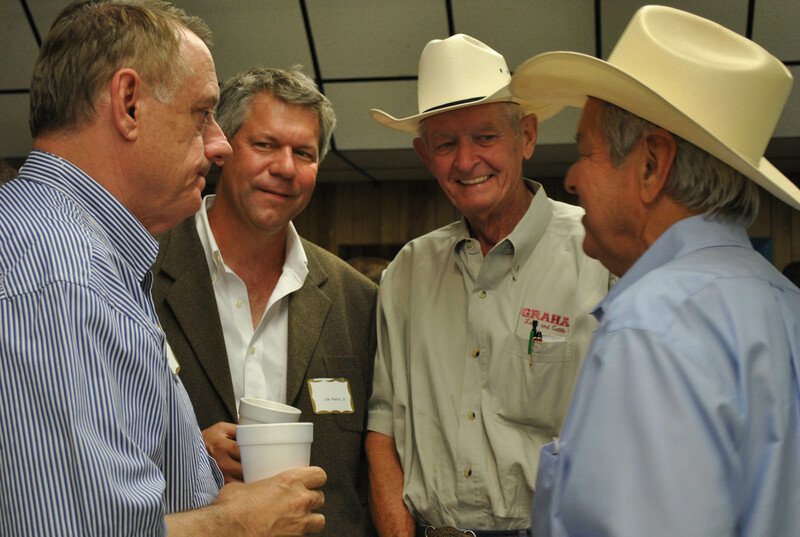 Several more influential professionals in the beef industry expressed their excitement for the new owners of Sam Kane Beef Processors and how the South Texas cattle industry has a bright future. The professionals included Molly McAdams, an independent beef consultant and Ethan Stool who is prominent in the animal pharmaceutical industry. However, the highlight of the night was when the program was turned over to the new owners and investors of Sam Kane Beef Processors. Lou Waters Jr., spoke on behalf of all the new investors. Waters discussed how the new owners would manage the processing plant, which would continue to keep the name Sam Kane despite Kane no longer being involved in the ownership. 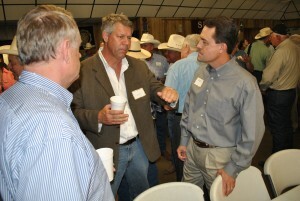 Lou Waters Jr. visits with Texas Commissioner of Agriculture Todd Staples. Waters continued with focusing on four points of management that the new owners would implement at Sam Kane. Quality and strength of branded products was also addressed to the crowd. Waters assured the crowd that Texas would see a lot more branded products coming out of Sam Kane Beef Processors. Waters also expressed that the new ownership will work closely with feeders and they will have people in the feedyards talking about price on a daily basis. He also noted that Sam Kane will not only work strictly with cash, they will also work off of grid pricing. New investor in Sam Kane Beef Processors Lou Waters Jr. and Dr. Charlie Graham of Graham Land and Cattle Co., visit with attendees of the Sam Kane Beef Processors Appreciation Dinner. 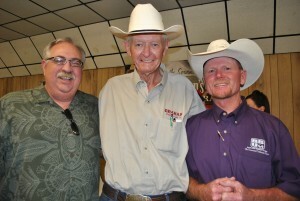 Waters ended with confidence that Sam Kane Beef Processors will bring a lot of cattle back to South Texas. The evening concluded with handshakes and congratulatory remarks. Beefmaster Breeders United is confident that this new ownership will be a positive impact to our breeders in South Texas, as well as breeders all over the world. The cattle industry will remain strong under this new leadership and Beefmasters will continue to be a great influence in South Texas, in the Mid-West and every place in between and beyond. Enjoyed reading about this event . Well written and nice photos . Lou Water’s has done a ton for this company. Under the past ownership rendering got neglected. But sonce he took over we see growth and updates, that needed to be done 20 years ago. Thanx again for the economy doing what it did. For us to get new owners who care about employees and their livelyhood.